Has anyone ever advised you to think about your breathing. Maybe it’s been something like “calm yourself down. Take it ease – BREATHE!” The basics are there but it’s a bit like saying to someone sedentary with a weight problem “Move more and eat better”, doesn’t it feel like something’s missing? Like HOW to breathe to calm down? As impaired breathing habits is very, very common, all aspirations for improved health and increased well-being should include improved breathing as a basic component. As we always have our breathing with us, we can apply our breathing retraining and establish new breathing habits in a simple, cheap and effective way anytime, anywhere. Breathing is an automatic function controlled by the respiratory center in the brain stem. The brain stem also controls several other functions for the body’s survival like temperature, heartbeat, blood pressure etc. 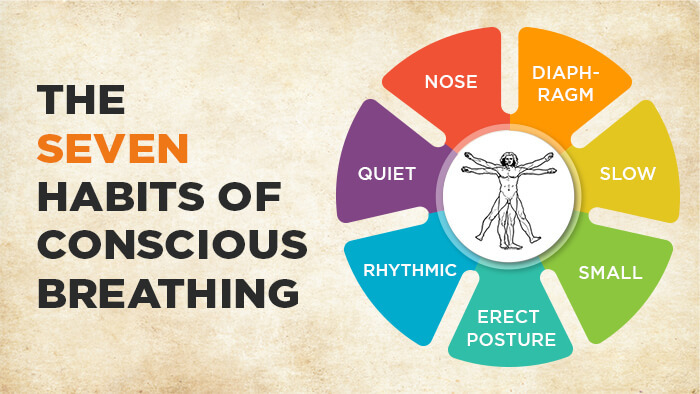 Good, conscious breathing habits means that our breathing is in and out through the nose, low and wide (reaches deep down in the stomach), slow, small, relaxed, rhythmic and quiet while at the same time our posture is erect. That’s it. Isn’t that easy!? Although the principles that makes good breathing habits are easy, the challenge is to get more and more of the 1,000 breaths we take every hour like that. 1. Nose – Good breathing starts in your nose. Here the inhaled air is prepared for the lungs, as it is heated, moisturized and cleansed from bacteria and other particles in the air before travelling down through the airways all the way to the lungs. On exhalation, the nose is reheated and remoisturized because the air coming up from the lungs is body-tempered and 100% humid. The particles that get trapped on inhalation follow the air out again during exhalation. When we breathe through the mouth we absorb air that is cold, dry and full of particles, making the airways irritated, inflamed and narrow. So, in summary, we should both breathe in and breathe out through the nose. 2. Diaphragm – Our breathing should reach into the lower part of our lungs, which means we will use the diaphragm, our main breathing muscle. The diaphragm and the heart are the only muscles in your body that never rest, they are constantly active 24/7. The diaphragm is a dome-shaped muscle, much like an umbrella. As we inhale, the diaphragm moves downward and expands in all directions – forward, sideways and back. One can say diaphragmatic breathing is low and wide. Breathing properly using your diaphragm means minimum muscle activity to move the air in and out. Since we breathe so much it’s very important that it happens as efficiently as possible, so we don’t waste any unnecessary energy. The opposite of diaphragmatic breathing is shallow breathing that is very inefficient and often associated with stress and pain in the back, neck, shoulders and head. 3. Slow – A healthy breathing rate is very slow with no more than 6-12 breaths per minute. However we tend to breathe at a much faster rate which is associated with stress and poor oxygenation. When I count the number of breaths on people, without them knowing, most of them take about 18-25 breaths per minute, which is enough to last for 2-3 people. 4. Small – A normal breath, at rest, contains only about 0.5 liter of air, equaling a respiratory volume of about 3-6 liters per minute (6-12 breaths per minute and 0.5 liter per breath). Since many of us have a tendency to both take bigger breaths and breathe faster, it is common with a breathing volume of 10-15 liters of air per minute, which exceeds our bodys need by 2-4 times. This creates an imbalance in our body between oxygen and carbon dioxide since it gives us too much oxygen and too little carbon dioxide. 6. Rhythmic – How are you breathing when you concentrate, text or in front of the computer? It’s very common that we hold our breaths in these situations. When we start to breathe again we will compensate by over-breathing. At night we call it sleep apnea and it has serious negative effects on both our sleep and our health in general. During daytime I call it concentrations apnea, shifting between breath hold and over breathing, similar to a bumpy car journey where we have the foot on the gas one second and on the brake the next. 7. Quietly – When we sniff and snore, sigh or clear our throats we do actually breathe. Every time we make a sound, air is moving in and out of our lungs. These breaths are very ineffective which creates an unnecessary stress to our body.